‘Cause I can quit whenever I want to …. 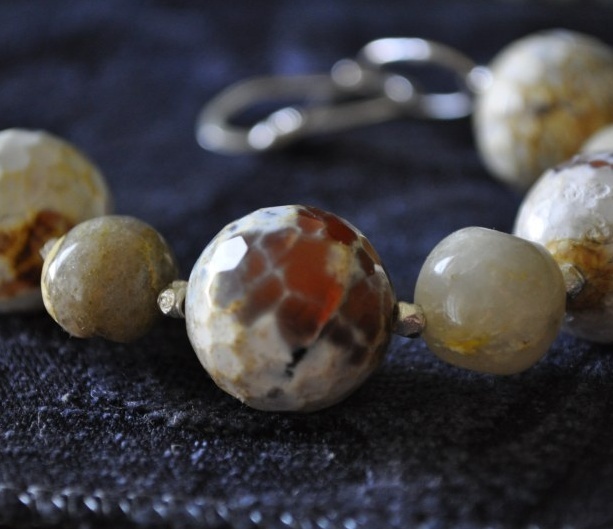 These agate "golfballs" were prominently featured in a necklace that was the hit of my trunk show ... next up ... GREEN! 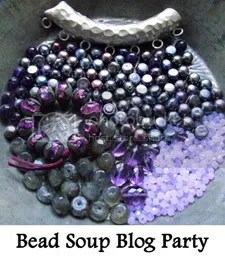 Who among us hasn’t gone to a bead show with the best of intentions and found themselves going leaving a wee bit wild-eyed? Folks, I am fresh from about 4 hours of solid bead shopping and wanted to put down some thoughts to share with you right away before my nerves have a chance to settle (and I add up a the final damage). Here then, in no particular order, is a list of 10 things that have recently occurred to me. When floundering, ASK — I never would have found the particular type of lentil Czech bead and 3mm Picassos I needed if I hadn’t had the extremely knowledgable Russian lady in the Czech and Swarovski booth helping me. Why did I eat that hot dog? I’m not really a hot dog sort of gal. Really. What good luck that I found more of those wonderful teardrop lampwork beads that I thought had gone out of stock everywhere forever because the mandrel they require is no longer made … at least that is what I’d heard. Top drilled pearls are especially pretty when you string seed beads in between. The effect is so very petal-like. I had bought several strands years ago during a big Fire Mountain sale but never knew what to do with them until recently. Today I stocked up. There is a place in the world for pewter findings. I’m not going to use them in my Etsy store, but why not use a few for classes and my own particular fun? Found a whole tube of “Pewties” (nickel-free) that look like little Hill Tribe nuggets (sort of). For $8. I’m finally over my labradorite craving. Don’t get me wrong — I still love looking at my own collection — but I was finally able to get through a bead show without buying some of those beguiling stones. After a full day of bead shopping at the Innovative Bead Expo, I’m here to tell you that there’s really no need to go to the Rock and Mineral show in the next town over (I wish someone had told me). But if you do go, be thankful you didn’t bring your 10-year-old son along because he would want one of EVERYTHING. I wish I had the common sense to really listen to my mother. If she had seen me headed out the door, I know she would have urged me to wear more comfortable shoes. Good thing this wasn’t the big Philly bead show! I’ll post a few new “stash” pictures shortly — and if you happen to live in or around the Lehigh Valley, it seems there’s going to be another gem show happening next weekend at Jake’s in Barto … Maybe I’ll see you there! Sounds like fun! But when I read about your hot dog…my stomach turned a litte too! Glad I’m not the only one, Lindsey. And people in this part of PA take their hotdogs VERY seriously … in fact, it never ceases to make me laugh that there’s a German restaurant at the mall positioned right outside of Macy’s, so as soon as you finish walking through their makeup department and its haze of perfume, you’re hit with a hard fog of sauerkraut and hot dog smells coming from the restaurant.